Geek Lit Etc. : Manga Monday: Does love have to be unplanned? The truth behind Shiro-sensei's behavior finally becomes clear to even Hina in Suki: A Like Story Volume 3. Note: Suki: A Like Story Volume 3 is the final volume in a series. For Volume 1 click here, and for Volume 2 click here. Otherwise, read on! As the crises come to a head, and kidnapping #10 is imminent, it seems like even Hina would have to realize that her neighbor and homeroom teacher isn't exactly what he seems. Unfortunately, that just doesn't seem to be the case, and her protectiveness of her friend ends up in her being kidnapped yet again. Even after returning to school, Hina is still the almost pathologically forgiving and kind girl that she's always been. No normal person would forgive Emi for organizing her kidnapping, but Hina realizes that with her father in such debt, Emi would have done whatever she must to save her family. It's a little bit much for Hina to ask Emi to remain friends with her, but it's just her nature. Perhaps the most strained relationship in Hina's life is that between herself and Shiro-sensei. Now that Shiro has failed, and in almost the exact same way he's failed before, he's ready to leave the area and put this assignment behind him. Will Hina forgive him as well, and perhaps find out about his feelings for her as well? 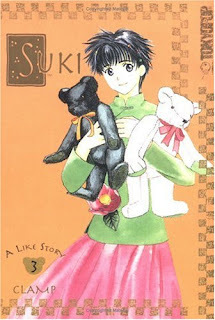 Even in its ending, Suki: A Like Story is classic 1990s shojo romance. CLAMP became the foremost manga team of the era for a reason, and this is just the kind of sweet story that gave them their reputation. Highs: There's a certain sweetness in this sort of story that more modern manga seems to be missing. Lows: I wish that Suki's other friends had a bit more time to be fleshed out. Verdict: A wonderful story that isn't told all that often anymore.